I had a legal phone call with Mumia today. The doctor we are working with is recommending that Mumia be seen by an oncologist and given an occult malignancy workup, including a skin biopsy, in order to detect the potential presence of a hidden cancer. This workup should search for a Lymphoma, including the Exfoliative/Eczematous form of Cutaneous T Cell Lymphoma. This is especially so given that medical records obtained this week indicate that a CT scan from April 15, 2015 showed abnormal lymph nodes in the groin and around the aorta. It is imperative that Mumia obtain a diagnosis of the underlying condition, whatever it may be, that has been responsible for the severe skin rash that has lasted several months so that a treatment plan can be developed and implemented immediately. 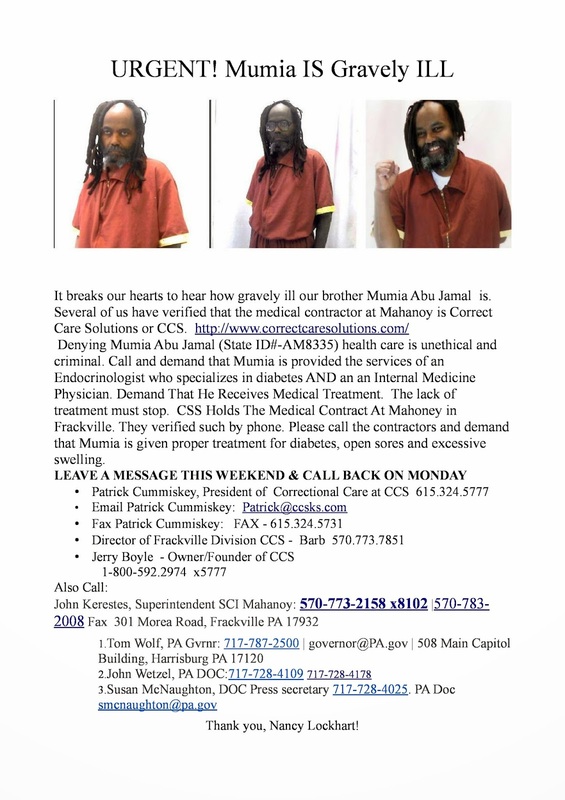 Mumia told me today that prison medical staff came to see him around 2:00pm yesterday to check his lymph nodes and tell him they may do a biopsy. This occurred approximately two hours after I sent the DOC the recommendations of Mumia’s doctor that he be seen by an oncologist, given an occult malignancy workup, including a biopsy, and searching for the presence of a Lymphoma. I will be visiting Mumia tomorrow. Mumia is still in the infirmary. He is no longer being given cyclosporine. His lower extremities are still swollen but not as severely as they were a few days ago he reports. His skin condition is the same as it has been, with a rash over much of his body, extremely itchy, dry, and flaking. His blood sugar levels have been stable, he is no longer on insulin but is taking glucophage twice per day. Mumia sends his love to everybody. Major problems began for Ramsey Orta immediately after filming the NYPD murder of Eric Garner. Ramsey has been stalked and harassed by police on a continuous basis. Ramsey fears for his life. Rat poison has already been located in food. See the information below. "The same day we held the press conference (March 12th) a hearing was taking place in Federal Court. A law suit was filed on behalf of 19 inmates who were denied medical treatment and or testing because of the rat poison discovered in Meatloaf. The Anna M. Kross facility on Rikers Island admitted the substance found in the meatloaf was in fact rat poison but claims no knowledge of how it got there. This is the exact facility where Ramsey Orta is being held. The judge dismissed the lawsuit claiming to be unable to determine what the inmates suffered as a result of the rat poisoning because all had submitted the same paper work in the case. There are several stories regarding it online." See the link below. White Supremacists donated roughly one million dollars to George Zimmerman as a reward for murdering Trayvon Martin. Darren Wilson received about the same amount for murdering Michael Brown in Ferguson, Mo. Why can't we assist Mr. Orta with $16k dollars for bail? He filmed the video of the NYPD Eric Garner murder. Ramsey Orta filmed the NYPD murder of Eric Garner and has been harassed ever since. He has been unjustly charged many times and is currently in prison on trumped up charges.